I have raved before how much I love Burt’s Bees and this review is no different after trying out their new Tinted Lip Balm. They are one of my favourite brands of beauty and body care products and I am always checking out their section at our local pharmacy. Burt’s Bees has won a slew of awards from many top health and beauty magazines including Best Eco-friendly product line from Teen Vogue and Shape Green Living Awards so I am not the only one who thinks they are top notch. Burt’s Bees Tinted Lip Balm is a brand new product that I was so lucky to try out early before its launch nationwide in February 2011. You are going to want to watch for this one because it rocks! It’s a lip balm with a hint of colour and a sweet taste. It comes in six shades and is made from natural botanical flower waxes (ylang-ylang and jasmine), Shea Butter, Vitamin E and Beeswax. It has a sweet pear flavour that makes it so easy to put on because it tastes yummy! 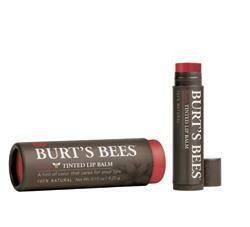 Best of all it’s 100% natural and like all other Burt’s Bee products has no petrochemicals or synthetic ingredients. The lip balm goes on like a dream and makes my lips feel super moisturized which is a must in our cold Canadian winter climate. Dry lips plague me when the weather gets cold so I am always moisturizing. With this lip balm, I can moisturize and add colour to my lips so there’s really no need for lipstick unless I want my lips to really stand out. The shade I received was Rose and it is very close to the lipstick I wear so all I put on is the lip balm and have no need to use my lipstick for day-to-day wear. I can’t wait to see the other shades available when this product comes out in stores in February. They will cost $7.99 each and I will be definitely checking them out and picking up more….because a girl can never have too much lip balm right? Hand Salve is the best!